Certaines bombes notamment celles d’un poids supérieur à 1000 kgs avaient un Kopfring ou anneau d'acier monté autour du nez pour éviter la pénétration excessive avant d'exploser. Pour les attaques à basse altitude notamment contres les vois ferrées certaines bombes comme les SC 50 et SC 250 étaient équipé d’un détonateur de contact afin d’exploser immédiatement pour éviter les ricochets. Cette version a été nommé Stachelbombe (Spike Bomb), en abrégé Stabo La SC 250 fut aussi utilisée comme une grenade contre sous-marins. La SC 2500 fut la plus importante bombe utilisée contre la Grande-Bretagne. Sauf pour les deux version les plus importantes il pouvait y avoir des sous modèles avec des versions différentes. En effet la puissance de la bombe pouvait être modulée et recevoir ou ne pas recevoir un Kopfring . 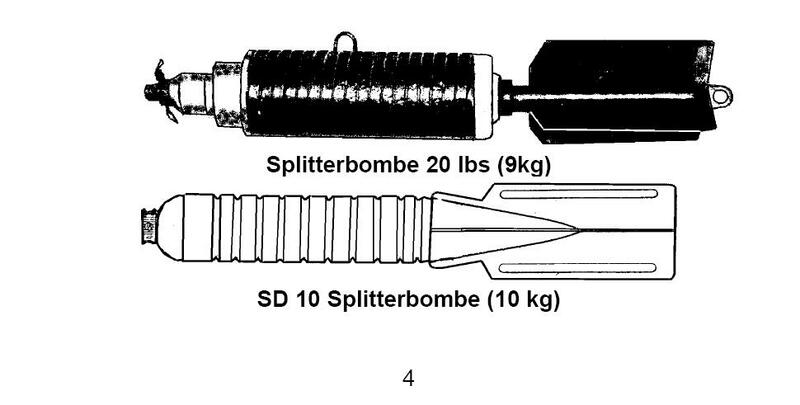 This was a thin cased general purpose bomb which was designated by weight in kilograms - therefore a 50kg general purpose bomb became an SC 50, they contained 55% explosive which made them ideal for general demolition. There were SCs weighing 50, 250, 500, 1000, 1200, 1800, 2000 and 2500 kilograms. A Kopfring was sometimes fitted to the smaller bombs but was a fixture on those weighing over 1000kg, the Kopfring was a steel ring fitted around the nose to prevent excessive penetration before exploding. 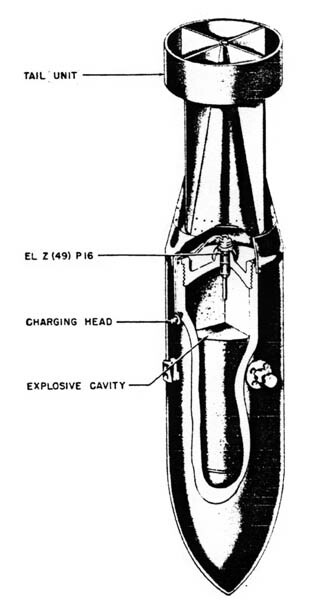 There were a number of variations, when armed with an Electrical Impact Fuse, El.AZ (38), the SC 250 was used as a depth charge against submarines. 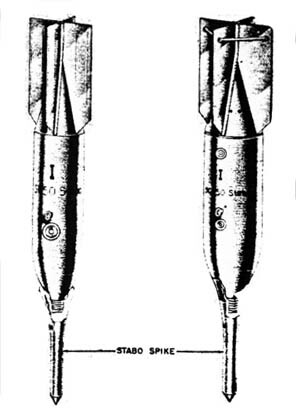 The SC 50 and SC 250 could be fitted with a spike on the nose, this was used in low altitude attacks against railways and roads to prevent ricocheting, this version was named Stachelbombe (Spike Bomb), abbreviated to Stabo. 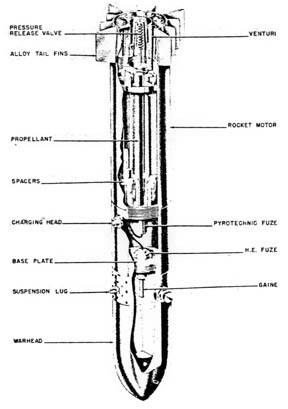 Small incendiary bombs were sometimes attached to the tail fins of the SC 50, they were secured by a clip, but the best known attachment to the smaller SCs was a cardboard tube about 14" long and cut like an organ pipe which gave out a shriek when the missile was falling. The Germans called this device 'The Trumpets of Jericho'. SCs up to 500kg were painted grey-green, the Stabo version was painted field-grey, the SC 1000 called 'Hermann', the SC 1200 and the SC 1800 called 'Satan' were painted sky-blue, the SC 2000 had the body and tail painted black, the SC 2500 called 'Max' was made of aluminium alloy, all had a yellow stripe painted on their tail fin. The SC 2500 was the largest SC dropped on Great Britain. Except for the two largest bombs in the SC category, there were a number of different versions of each weight. 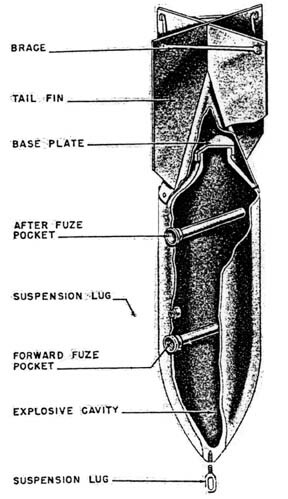 This could be determined by a change of fuse, the number of fuse pockets, a different filling, whether or not a Kopfring was attached, the casing was a different shape or a new type of tail unit was fitted. Avec une charge explosive de 35% ces bombes étaient idéales pour une utilisation contre des fortifications mais aussi comme des bombes anti personnel. 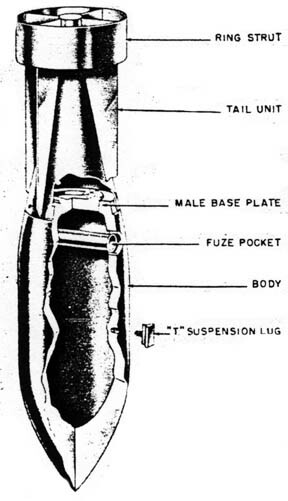 A medium case steel, semi armour piercing fragmentation bomb. 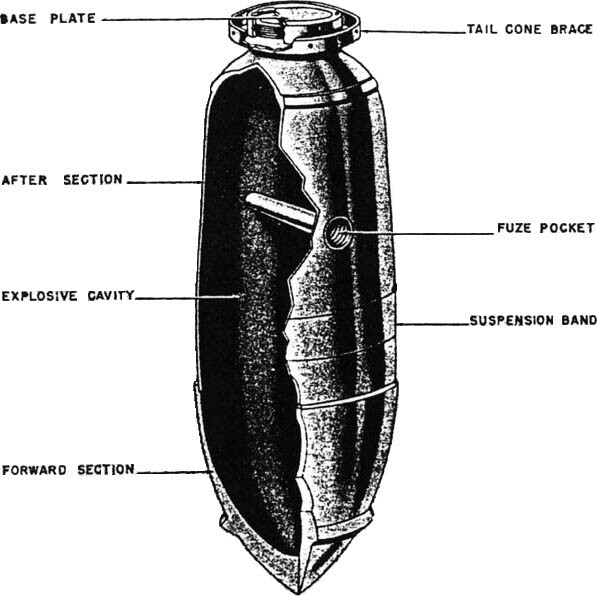 With an explosive filling of 35% and their penetration qualities, these bombs were ideal for use against fortifications or shipping, they were also used as anti personnel bombs. The weights were 50, 70, 250 and 1700 kilograms, up to 250kg they were painted grey-green, the 1700 was coloured sky-blue, all had a red stripe painted on their tail vanes or their tail cone was painted all over. She had a cast steel body with a hardened cast steel nose cone and with an explosive filling of 20% were classed as armour piercing. They came in weights of 500, 1000 called 'Esau' and 1400 kilograms called 'Fritz' and were all painted sky-blue with a dark blue stripe on the tail vanes. Ideal for use against fortifications and shipping, rarely used on 'soft' economic or industrial targets. The 1400kg version was later converted to a radio-controlled bomb. Introduite en Janvier 1944 c’était une bombe ralentie par parachute d’un poids de 1.000 kg contenait 80% d'explosifs conçue pour provoquer le maximum de dégâts dans les zones bâties Elle avait été conçue pour la soute à bombes du Messerschmitt Me 410. Elle était peinte en gris sur le terrain et le parachute était rouge, vert ou bleu. Introduced in January 1944 this was a thin walled high capacity parachute 1000kg bomb which contained 80% explosive designed to cause maximum damage in built-up areas and shaped to fit into the bomb bay of the Messerschmitt Me 410. The fuses were arranged to provide instant detonation. 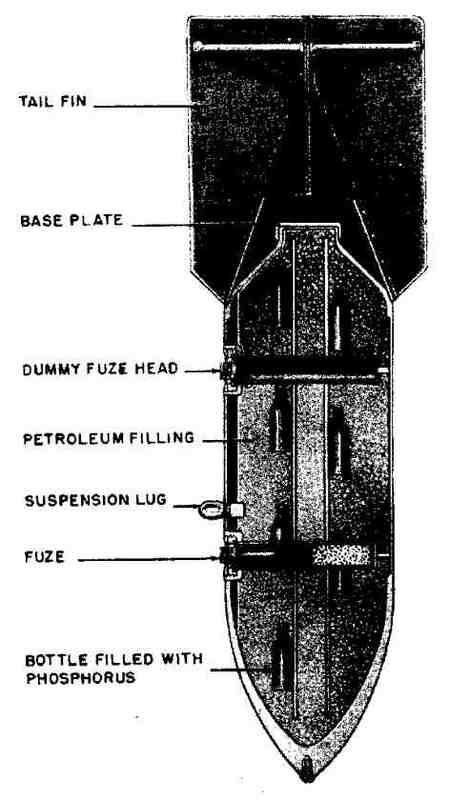 The bomb was oval in shape and measured 1.80m length for a diameter of 0.82cm The parachute had wire stiffening and was about 12 cm' in diameter, secured to the bomb by thirty-two cords. The missile was painted field grey and the parachute was coloured red, green or blue. Initialement destinés à être utilisé comme des mines marines ces mines Luftmine A (LMA) de 500kg et Luftmine B (LMB) de 1000 kg, à partir de Heinkel He 115 furent utilisées par les allemands comme «mines terrestres» à compter du 16 Septembre 1940.
un fusible d'horlogerie déclenché les mines terrestres. Originally meant for use as sea mines and known to the Germans as Luftmine A (LMA) of 500kg and Luftmine B (LMB) of 1000kg they were known to the British public as 'land mines'. Basically there were only two sizes, 500kg, which was 1.7m long and 1000kg, which was 2.8 m long and were triggered magnetically at sea, a clockwork fuse triggered the mine on land. They were first dropped in our coastal waters by Heinkel He 115 seaplanes flying at 900', in November 1939, and first employed intentionally against land targets on 16th September 1940. 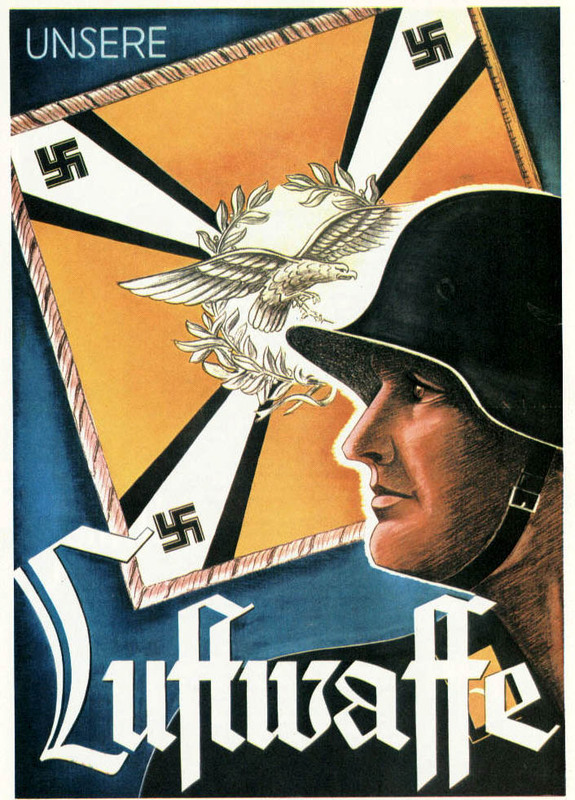 The luftmine had an explosive filling of between 60% and 70% and was capable of creating a lot of blast damage. Il s'agissait d'une luftmine 1000kg (LMA ) équipée d'un empennage en bakélite, qui éclate à l'impact. 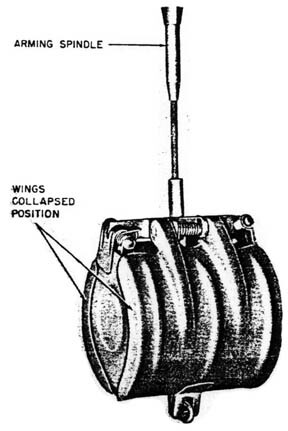 known to the British Mine Disposal Service as the G Mine this was a relation of the 1000kg luftmine, but it was fitted with a tail unit made of Bakelite, which broke up on impact. With the same magnetic and acoustic functions it was designed to be dropped like a conventional bomb. Beneath a dome shaped cover there was a photo-electric cell device which when exposed to light detonated the bomb, this was a security device to protect the magnetic and acoustic components from bomb disposal units. The overall length was 2.8m, the body was 2 m long and 0.67 cm wide. Les conteneurs sont ouverts à une hauteur prédéterminée par un fusible libérant les bombes qui sont armées durant leur chute. Elles étaient peintes en gris-vert ou jaune avec une bande rouge. 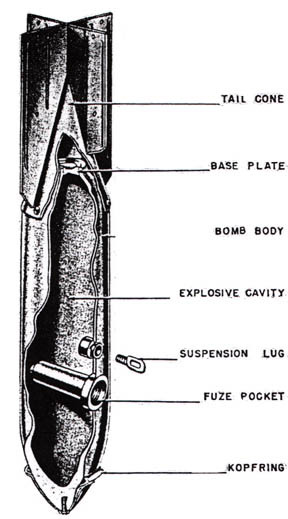 Les Allemands ont aussi utilisé d'autres types de personnel de bombes anti (la SD 1, SD 10 et SC 10 dans des formes variées), mais aucune d'entre elles n’ ont été utilisées de façon intensive comparé à la SD 2.
known to the British public as the 'Butterfly Bomb', the SD 2 was the one that was used most frequently. These 2kg fragmentation bombs were dropped in containers holding twenty-three or more, the containers were opened at a predetermined height by an airburst fuse, releasing the missiles which became armed as they fell. 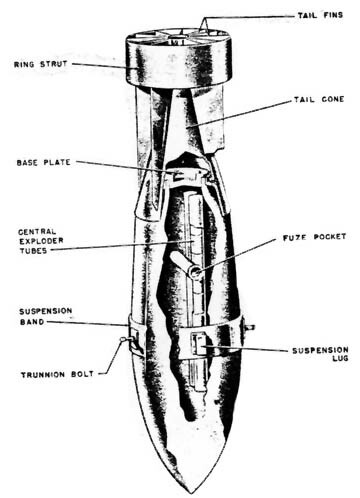 The bombs looked like a mallet with a very thin, 1.5m long handle and as they fell, the outer shell casing opened up forming a kind of parachute the two round end pieces acted as wind vanes causing the whole assembly to rotate around the bomb which unscrewed its way up the cable and armed it before it hit the ground. Once they were armed they could not be handled and the only means of disposal was by controlled explosion or, if caught in the branches of a tree or telephone wires was dealt with by .22 rifle fire. Ces bombes étaient armées lors de leur chute lorsque le débit d'air provoque le mouvement d’un disque métallique qui fait sauter la sécurité par traction d’ un fil armant celle-ci Le Civil Defence code pour cette bombe était IB. Les allemand piégèrent aussi ces bombes sur les empennages ou les cônes (Code anglais IB et Ibsen) pour dissuader les pompiers. One of the most effective weapons used against the UK during WW2 was the 1kg or 2kg magnesium incendiary bomb. World-wide, between 55% and 75% of the damage to towns and cities during the war was due to saturation bombing with incendiaries. 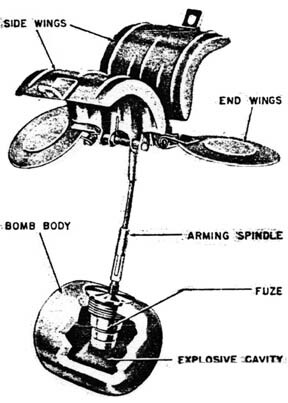 Whilst falling the incendiaries were armed when the airflow caused a metal disc to pull a wire which in turn withdrew a pin from the lock that held the firing pin in the impact fuse in place. The bombs had a thermite filling which ignited the magnesium casing. The Civil Defence code for this bomb was IB. the body was painted green, the explosive section black and the tail grey. these were incendiary bombs which came with the same external dimensions as the 250 and 500 kilogram SC bombs. The Flamm C 250 filling was 50kg of oil incendiary mixture and a small TNT bursting charge. 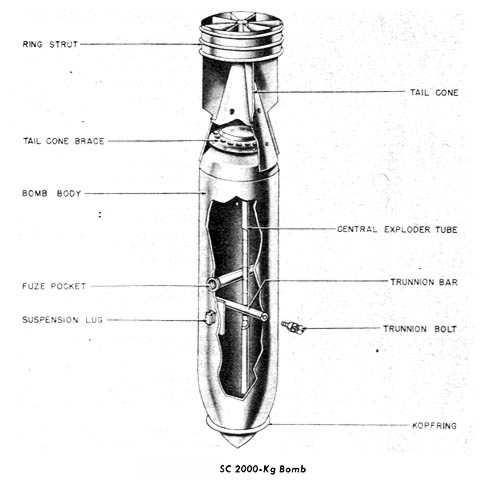 The Flamm C 500 had a filling of 70% petroleum and 30% TNT and a small TNT bursting charge. 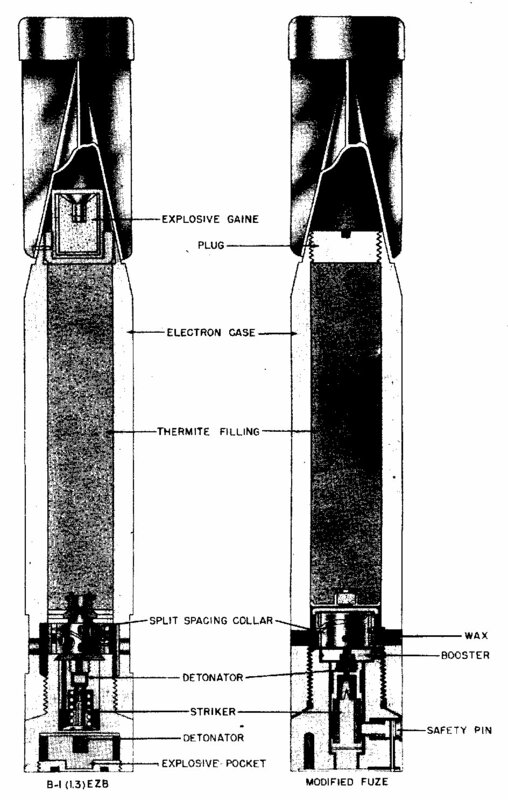 A special electric proximity fuse which was designed for these bombs. 250A C avait un remplissage de 87,7 % de pétrole, 11,7% de polystyrène et de 0,5% de phosphore. Le phosphore était contenu dans des bouteilles en verre qui éclatent à l'impact et en se mélangeant à divers autres produits prennent feu spontanément. This series of incendiary bombs were the same shape and size as the 50kg and 250kg HEs and were known to the Civil Defence as PhIB. The three versions of this IB were:- C 50A which had a 13½ kilogram filling of 86% benzene, 4% phosphorus and 10% pure rubber, the C 50B had a filling consisting mostly of white phosphorus and C 250A had a filling of 87.7% petroleum, 11.7% polystyrene and 0.5% phosphorus. 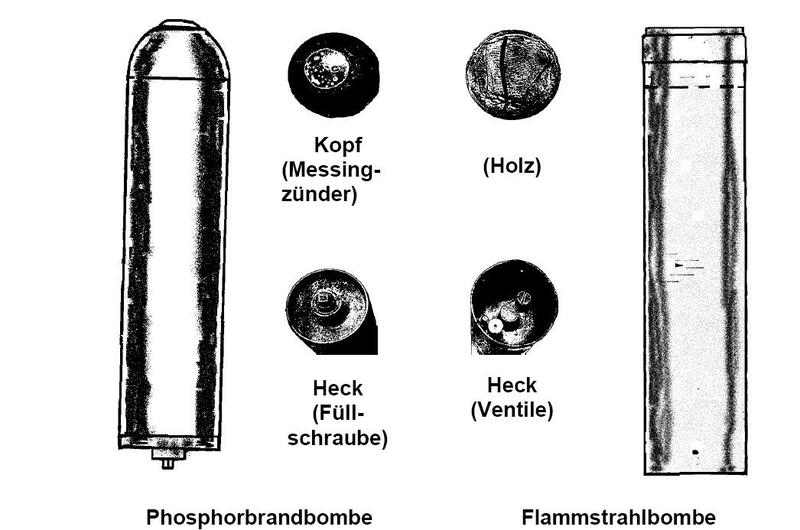 The phosphorus was carried in glass bottles which burst on impact and mixed with the main filling that had been scattered by the impact fuse, it then ignited spontaneously. There were two main types of this parachute flare one container holding a single, and the other four candles. Five seconds after leaving the aircraft the container expelled the flares which ignited and burned with intense light and heat, their parachutes opened and the flares drifted slowly to earth. The parachutes were of silk or artificial silk and were 25clm in diameter. There was also a smaller parachute flare 7 cm in diameter, also released from containers. Les Conteneurs étaient utilisés pour obtenir une concentration de bombes sur une cible donnée. 'AB 1000 représentait Abwurf (jeter) et Behälter (conteneurs) et 1000 représente le poids équivalant à une bombe à 1000kg. Le plus grand, fur le AB 1000-3 qui mesurait 3.2m de long. Il pouvait emporter 36 bombes de 1kg ou 24 bombes de 2 kg incendiaires. Le ABB 500 mesurait 1.7m de long et 0.5o cm de diamètre il pouvait emporte dix bombes incendiaires de 100 kgs ou 140 bombes incendiaires de 1kg . these were used to give a concentration of missiles over a given target. 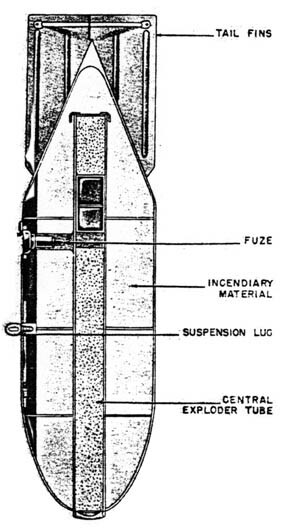 The container was usually bomb shaped and had a small burster charge activated by an airburst fuse, this could be set to operate at any predetermined height. Missile containers were grouped according to the stowage space they occupied in the plane. 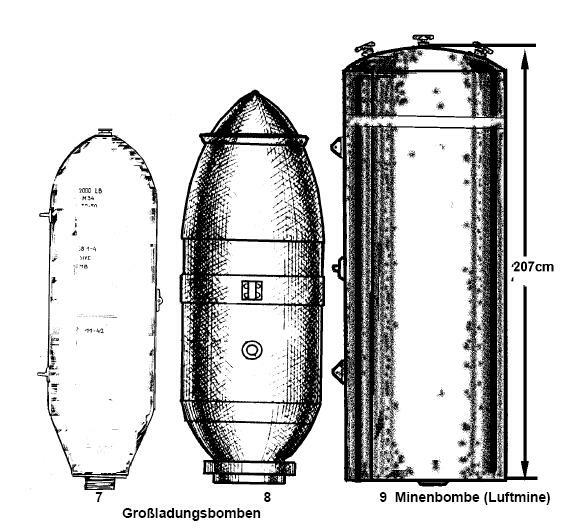 German classifications were simple, the AB 1000 stood for Abwurf (throw away) and Behalter (container) and '1000' for size not weight equivalent to a 1000kg bomb. If the prefix was ABB, the extra B stood for Brandbombe (incendiary bomb). Sometimes anti personnel or parachute flares were carried in these containers. There are only two types mentioned in the diary, the AB 36 and the ABB 500, although there were over twenty different containers, the largest, the AB 1000-3 which was 3.2m de long long. 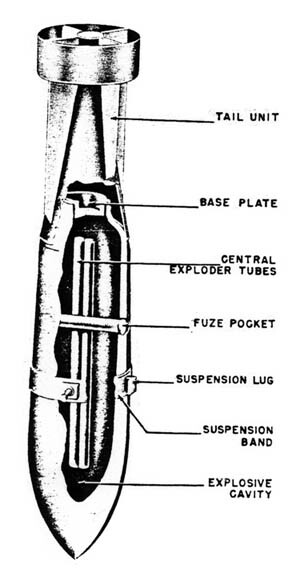 The AB 36 was 1.2 m long020cm in diameter and could carry 36 x 1kg or 24 x 2kg incendiary bombs. 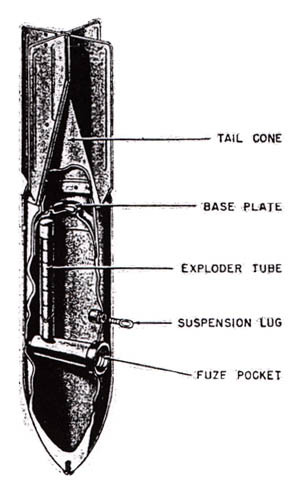 The ABB 500 was 1.7 m long with a 0.50 cm diameter and were painted slate grey with a red bands, they held ten single candle flares or 140 x 1kg incendiary bombs. Ils ont été transportés sous les ailes ou sous le fuselage et étaient seulement largués en cas d'urgence. IL emportait 320 bombes de 1 kg IBS. Le modèle 1000 était plus petit que la 700. Avec 2.47 m de long pour 0.67cm de diamètre : Il était de couleur chamois et contenait 620bombes de1 kg IBS. They were carried externally and only jettisoned in an emergency. 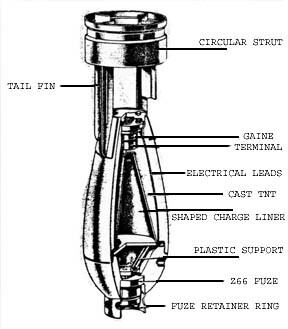 The release mechanism for the bombs being triggered electrically or by cable operation. The 320 was coloured black and was 2.4 m long and 0.55 cm diameter, He carrie 320 Bombs of 1kg IB . The 700 was painted sky blue was 3.1m " long and was0.67 cm in diameter and held 700 bombs . The 1000 was, surprisingly, smaller than the 700. It was 2.47m long and was 0.67 cm, coloured buff and held 620 bombs of 1kg IBs.